Since its founding in 1917, Morinaga Milk has centered its business on the manufacture and sale of dairy products. The Company has consistently endeavored to maximize the impressive qualities of milk since it was founded, and has achieved high brand recognition through its own product development capacities and its provision of high-quality, safe and reliable foods. 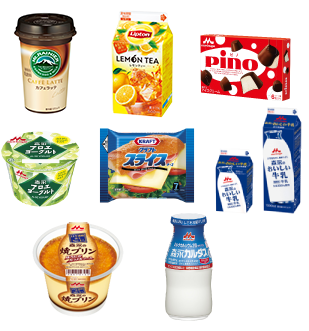 Morinaga Milk's business is divided into the functional and food ingredients business (B-to-B business), the international business, the health and nutritional food business and the B-to-C business. The B-to-C business is further divided into categories such as chilled cup-type drinks, ice cream, yogurt, cheese and milk. The varied product lineup in these areas contributes to the creation of a healthy and prosperous society for our customers. Cream and other products made from dairy, and functional ingredients such as Bifidobacteria, Lactoferrin, and dairy ingredients are provided to a wide range of sectors. This business covers the manufacture and sale of dairy ingredients by MILEI GmbH in Germany, the export of infant and toddler milk, and the manufacture and sale of aseptic tofu in the US, among other operations. This business includes nutritional foods, centered on infant formula, mail-order sales of supplements and other products, and liquid diet products run by subsidiary CLINICO Co., Ltd. This business accounts for a majority of the Company's sales and is Morinaga Milk's core business. This business provides a wide range of products that occupy a familiar place on tables, such as chilled cup-type drinks such as Mt. RAINIER CAFFÈ LATTE, chilled tea in the Lipton brand, ice cream, yogurt, cheese and milk. *Net sales figures are for the fiscal year ended March 2018. Net sales figures for each business are the consolidated sales figures. Net sales by product field in the B-to-C business are sales for Morinaga Milk on a non-consolidated basis.